There’s already a lot to love about the DJI Mavic (shop it here). This lightweight folding quadcopter shoots 4k videos and flaunts great features including in-built stabilization and subject tracking. Its Pro model offers additional perks such as automatic take-off and landing, smartphone controls, and tons of cool camera modes. I wouldn’t have imagined that the Mavic could get any cooler, but a recent product has actually managed to do that. Meet the PolarPro Katana (shop it here), a $50 accessory that lets you get even more out of your DJI Mavic quadcopter! All the features of the Mavic, now available for on-ground shots. The PolarPro Katana is a tray specifically designed for the DJI Mavic series. It is built around a simple but fantastic concept – when there’s so much that the Mavic can do in terms of shooting videos, there’s no reason to restrict it to aerial videography alone. The Katana tray system wraps around your Mavic drone, turning it into a handheld shooting device. The Katana opens up a world of creative possibilities for Mavic users. When you’re shooting a film that needs both aerial and on-ground imagery, you can now use the quadcopter to do both. So you no longer need heavy editing to ‘match’ the quality of the ground based shots from your camera with the cinematic aerial imagery from your drone. You also have the option of using your Mavic for photography or videography in no-fly zones. The Katana also lets you use your smartphone to control the drone. 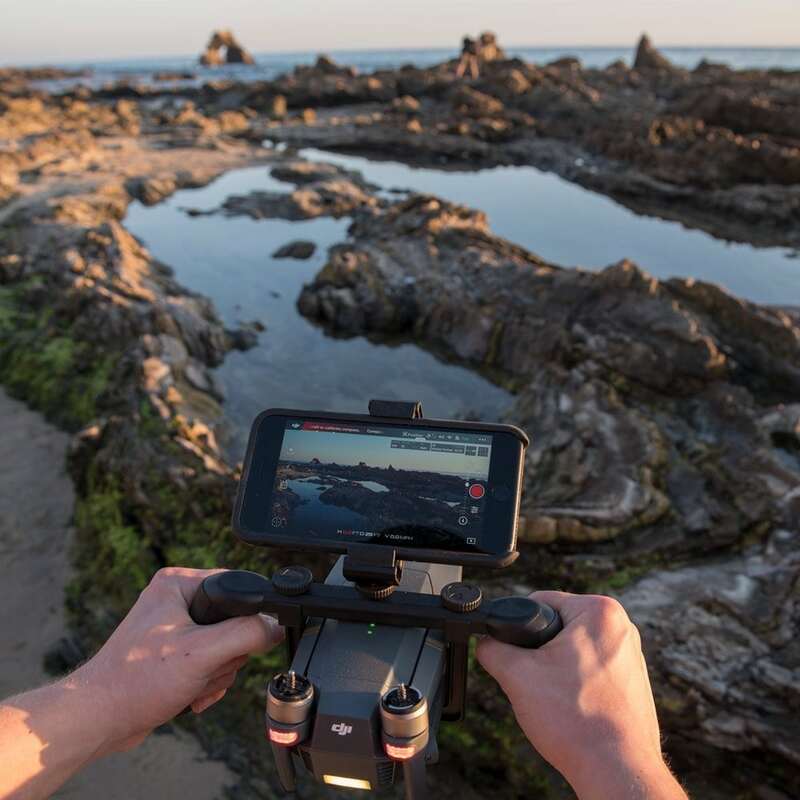 It has a built-in mount on top, which holds your mobile device at a convenient angle while you frame your shots or access the Mavic’s features through its companion app. The PolarPro Katana lets your Mavic last longer. Ground based video isn’t the only functionality that the Katana adds to the DJI Mavic. It also gives the quadcopter a fresh lease of (battery) life. You see, the Mavic’s camera itself doesn’t use a great deal of power. So if you pair the quadcopter with the PolarPro Katana and use it for on-ground filming, it can last you through 1.5 hours of continuous use. The airborne drone, in contrast, has a battery life of less than 30 minutes. The PolarPro Katana consists of a glass-filled nylon tray tailored for the DJI Mavic Pro and the DJI Mavic Platinum. A harness clamps the tray to both sides of the drone, and its phone mount can hold an iPhone 7 Plus (shop it here). The tray culminates in a grip on either side of the drone. The whole setup costs just $50, and upgrades your DJI Mavic quadcopter to an everyday-use camera that can shoot cinematic footage on ground. A pretty sweet deal for a budding filmmaker, in my opinion. What do you think ?